How Safe is Your Child’s Car Seat for Holiday Travel? The Insurance Institute for Highway Safety has categorized booster seats in terms of the highest safety ratings to help parents and caregivers make decisions about the appropriate product for their family. The booster seats were broken into three groups: best bets, good bets, and not recommended. The ratings examined how well the shoulder belt fit a test dummy of child size, so it’s important to realize that these classifications do not involve crash test ratings. What is a Best Booster Seat? A best bet booster seat is a product with a properly positioned belt for a 4-8 -year-old child to be used in any vehicle. Good bets were classified as those that provided acceptable belt fit in most cars, minivans or SUVs. Properly fitting a child into a car seat belt is critical for protecting them in accidents. Even minor accidents can result in serious injuries for the child when a car seat belt doesn’t fit properly. Both Diono models had issues with the shoulder belt fitting, while the lap belt fit was a problem with the Batman booster. The majority of backless boosters making the best bet list could be acquired for between $20 and $60, giving parents many options in terms of style and price to fit their needs. Knowing how to select and properly use a car seat is critical for protecting your child every time you’re in the car. For the best level of protection, keep babies in rear-facing seats for as long as you can. Typically parents can do this until the child is at least two years old. Rear-facing seats provide the highest level of protection for the spine, head, and neck. In the event that the airbag does deploy, rear-facing seats provide protection for children from this event. When the child has outgrown a rear-facing seat, it’s time to begin investigating options for a forward-facing car seat. Always keep the car seat located in the rear of the car, and refer to the labels on the product to determine the best product for your family. Most car seats now include labels about weight restrictions so that you can be sure your child will be protected in the event of an accident. Finally, take care to install the product properly. Tug the base of the car seat where the seatbelt passes through it. If the product moves more than an inch, you need to adjust the product for maximum safety. When the product has been installed properly, the car seat shouldn’t move any more than 1 inch. When you have questions about installing or using car seats properly, you can communicate with a child car seat safety technician in your area to get your questions answered and give you peace of mind about the product you are using. Remember, you are your child’s best advocate, so keep them safe this holiday season with these simple safety tips. Author Kay Van WeyPosted on December 12, 2014 Categories Product SafeyTags booster seat safety, car seat safety, car seat safety rankings, dangerous car seats1 Comment on How Safe is Your Child’s Car Seat for Holiday Travel? As a mother of two boys, I was shocked to read in the recent news of children who were ingesting Tide laundry pods and losing their lives. When a mother in Florida last year checked in on her baby, she discovered that her 7-month-old had somehow gotten ahold of a Tide laundry pod. The child, who had been sleeping in a laundry basket with the detergent pod, was taken to the hospital immediately. Tragically, even though the child was taken to the hospital immediately, it was already too late. He had already passed away from the poisoning. My heart ached for this mother, and I cannot imagine the suffering she and her family must have gone through as a result of such a senseless death of a precious baby. My two boys could have very easily done the same thing. These are popular with busy moms everywhere, and at one time or another, we have all had them in our households. Unfortunately, this is not the first parent who has discovered the dangerous nature of these convenient laundry pods. Poison Control centers across the country have logged thousands of calls from panicked parents in the same scenario. Academic research suggests that it’s a growing epidemic, with more than 17,000 children every year under the age of 6 swallowing the contents of the laundry pods. The colorful nature and small size of the packages make them attractive for children, and many parents are unaware of the serious nature of a poison incident from the pods. This makes for a deadly combination. Children might mistake the packages for candy, which is why it’s essential they are stored out of reach of children to begin with. The reaction from swallowing the contents varies by child, but many children have immediate responses to the pods. Violent vomiting or respiratory distress are two of the most common responses, but a child may also experience temporary loss of vision. These outcomes are especially scary for younger children who cannot voice what is happening to them, leading a parent to panic very quickly. The pods are definitely a cause for concern. The CDC has actually seen a general decline in accidental ingestion of household product poisonings over the past several years. However, the numbers related to laundry pod poisonings are only climbing. Legislators have finally started to react about the lack of labeling on the products. They are demanding an awareness campaign that would help clue parents in to the need to store these products in a locked closet or higher location, out of reach of children. Senior United States Senator from New York, Chuck Schumer, also asked in 2012 that the products be placed in child-proof packaging to reduce the chances that a child can even access the original packaging containers. In response, Tide did improve the packaging with a double lock on the lids, but many parents remove these lids for ease of access. If children have any access to the laundry area or container where the pods are stored, they should be moved right away to limit the chances of a serious accidental poisoning or death. While convenient and popular, these laundry pods carry a serious poison risk for children of all ages. Keep them out of reach! It’s time to pull the grills out an invite the friends to sit by the pool and enjoy a relaxing cookout while catching up. Nobody really thinks about anything dangerous occurring at a neighborhood cookout, and the last thing anybody wants is for an injury to occur. 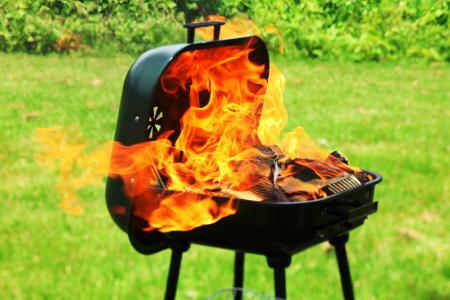 Unfortunately, though, gas grills can cause injuries in the form of serious burns. The National Fire Protection Association informs us that there are roughly 7,000 gas grill fires each year in the United States. With the pressing of a button an exploding fireball can shoot out too quickly for you to defend yourself. Thousands of people experience this each year, and you need to be aware of the possibility of it happening while you are grilling. There are safety measures that you should be aware of to deter a serious burn injury from a grill. Many of us know of the story of sports anchor Hannah Storm, who, unfortunately, experienced this first-hand. A fire ball shot out at her from her gas grill leaving her with first and second-degree burns on her face, chest and hands. She now uses her story to warn others that the same thing can happen to them. It can happen quite easily. How many times have you turned on your gas grill, but it fails to light the first time? When this happens, the propane begins to pool, and it is heavier than air under any conditions. When you attempt to relight it, boom! An explosion happens that quickly. If you start your grill up and forget about it, walk inside for a moment, then come back and light it, an explosion can occur. You should always start your grill with the lid up. If flames go out, open it up and make sure the propane is shut off. Let it air out for a couple of minutes, then turn it on and light it again. Be aware that propane buildup is more likely during cold weather grilling! Unfortunately, victims like Hannah, who re-lit the grill before letting the air out, suffered painful consequences that we all can learn from. It is an easy mistake to make, and many people are simply unaware of the risks. Examine the line that leads from your propane tank to the grill to ensure there are no cracks. If there are, that could mean a leak that could lead to an explosion. Check for this by putting soapy water along the line. Turn on the gas and watch to see if the soapy water bubbles. If so, you have a leak. Turn the gas off and do not use the grill until it is fixed properly. Thanks to the Consumer Product Safety Commission (CPSP), the grilling industry has developed safety standards to prevent the over-filling of propane tanks. This will prevent leaks that lead to fires and explosions. Now, an over-fill prevention device must be installed on all new gas tanks. Newer tanks have lobes with three prongs, while older ones have 5 prongs. If you have one of the older tanks, make sure you trade it for a new one immediately. It is my hope that you use proper precautions, and that you will be aware and hopefully avoid any type of injury while grilling out. Share these tips with your family and friends to ensure everybody has a safe, enjoyable summer. After all, cookouts with friends and family should be enjoyable, relaxing times! Stay safe and enjoy your summer.